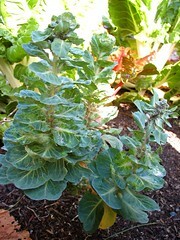 I pulled up the spent Brussels Sprouts and the bolting Bok Choy and Collards that were filled with aphids. 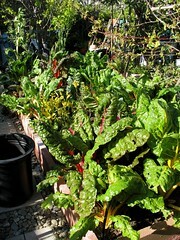 The French Sorrel has grown quite a bit and is also starting to bolt. 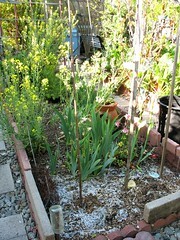 I cut back the flower stalks., but didn’t pull these up so it can produce more baby plant that I can divide later. I set up the second compost bin that I bought in January in one corner of the backyard and placed all the trimmings from above in it. 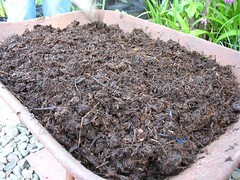 I looked in my older compost bin (see my LiveJournal icon), and we have some good compost, that needs to dry out a bit. 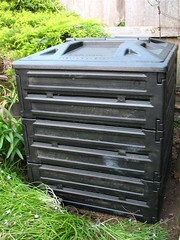 I empty this into an old wheelbarrow and will use it to dress some of our fruit trees and maybe also add to the vegetable beds. The Taro I planted two weeks ago is now 6-1/4 inches tall and a leaf is starting to emerge. The Coleus from Rosy Dawn Garden have graduated from the indoors spent their first full day outside. Now I can bring my Coleus from work home and slowly introduce them outside. 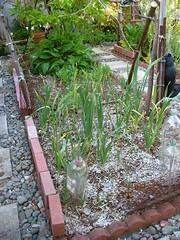 This entry was posted in Uncategorized and tagged bok choy, brussel sprout, coleus, collards, compost, french sorrel, status, taro, vegetable bed. Bookmark the permalink.